Prolonged use without proper maintenance can render your carpet lose and shabby! Definitely, you love your beautiful home and do not want to ruin its beauty because of loose carpeting. Carpet repair and regular cleaning are the answer to your problems. You can either do carpet repair on your own or you can go for professional carpet restretch. FYI, there are multiple cleaning companies which offer restretch your carpet in Melbourne, Toms Crapet Cleaning is one such organisation, dedicated towards carpet restretching services with maximum efficiency and offering a great customer experience. First of all, you need to shift all the furniture a little aside so that it becomes easier for you to access the carpets. Also, hoover the excess dust by vacuum cleaning of the carpets. In order to clean your carpets, first you need to detach them from the wall. Use a flat head screwdriver to assist you in removing the staples and a piler to gently peel off the carpets from the wall. Do this carefully without damaging the padding underneath. You can also take help of a pry bar to remove the carpets from tack strips. For stretching of the carpet, you’ll need a power stretcher. Place the stretcher apposite to the edge of the carpet in such a way that it is at least 6 inches away from the opposite wall. Embed the teeth of the machine in the carpet by pushing the lever down. As you apply more pressure, you will be able to notice more stretching. Use a carpet trimmer to trim the extra ends. To trim the excess, first make a slit on the ends where you want to trim. Then, place your cutter in the slit and cut with the help of your cutter. Stretch the carpet and place it into all the corners, small spaces or around the built in feature of the wall with the help of knee kicker. Embed one end of the teeth into the base padding for stretching. Stretch the carpet to the wall by slamming your knee against the wall. Repeat kicking for a few times to get the desired results. With the help of staple gun, staple the carpet to the padding. 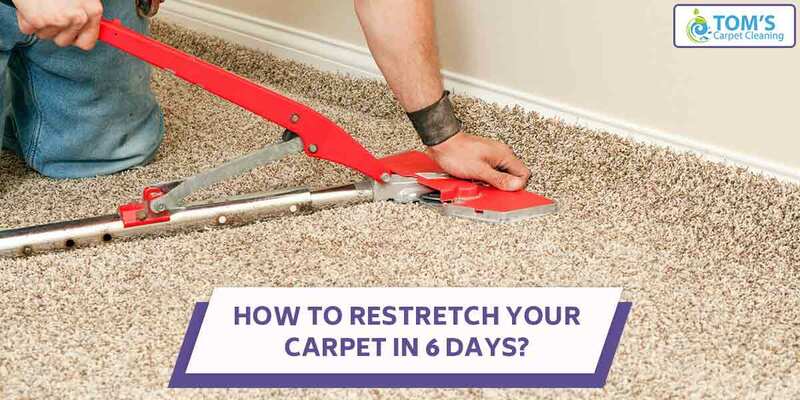 This is all about the process of restretch your carpet! If you want any assistance for the same, you can take help of the professional carpet restretching service provider. as well. Toms Carpet Cleaning is one of the most asked for Carpet Restretch in Melbourne. Call us to get same-day, on-site carpet cleaning or carpet repair service on 1300 068 194.